Monday to Friday, from 2:30pm on (ask for availability, or special cases), private mode, according to students availability. From Monday to Friday, schedule to be agreed, minimum session: 2 lessons (90 minutes). With years of experience in Spanish classes, bilingual, and an extensive knowledge of Latino American and Chilean culture. Whether it is an intensive course, or a few lessons per week, on one-on-one modality. Since January, 2003 teaching Spanish courses in Chile! Grammar and culture in harmony, dynamic sessions, great availability from our staff and a variety of materials for the classes. We can adapt to your needs and objectives. A few meters away from Bellas Artes metro station (L5/Green Line,) a few blocks away from downtown, close to Forestal Park, surrounded by museums, cafes, bookstores, etc. Extracurricular activities, tours (once a week, for intensive courses,) watching movies and documentaries, among others. Pleasant atmosphere that will make you feel comfortable through your Spanish learning experience. Newen is a small language school that offers Spanish courses in Santiago. We are moved by the transmission, not only of our language, but also of our culture. That is why we have chosen “Newen” as our name, a word that means “cosmic energy” in Mapudungu, the tongue of Mapuche, one of the most important indigenous nation in our country. French teacher from Universidad Metropolitana de Ciencias de la Educación (Santiago, Chile). His passion is rock and the native cultures from our country. His students feel really inspired thanks to his methodology that encourages them to speak from the very first class. 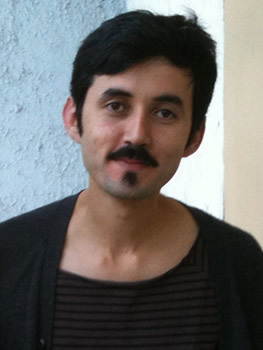 English – Spanish translator from the Universidad of Concepción (Concepción, Chile). 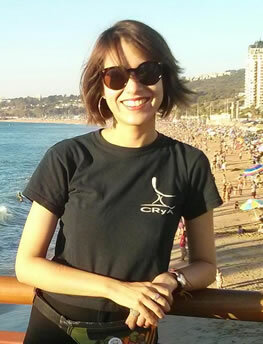 She loves to travel, that is her passion, which led her to teach Spanish as a foreign language in France some years ago. Her classes are prepared with great dedication, in order to meet the specific needs of her students. 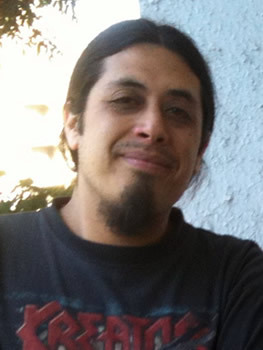 He holds a Bachelor in Arts from Universidad Arcis, has studied English- Spanish Translation at Universidad Católica de Valparaíso, and is also a poet. Great connoisseur of Spanish Grammar, he is also an expert in cultural topics. His students feel that with him they are not only learning a new language, but they are also getting to know about it on a much deeper level, which helps them to understand the intricacies of our tongue. Our Principal. 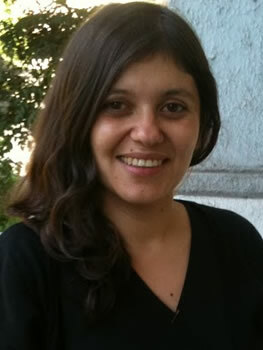 She holds a Bachelor in Spanish and Hispanic Literature from the Universidad de Chile (Santiago, Chile.) She is also a Masters graduate form the program of Spanish Linguistics from the same university. She works as a Spanish teacher since 2000. Her bicycle and books are her passions in life! Chile is known for being an extremely long country, which gives it the characteristic of possessing a huge array of different landscapes and weathers. In the North part of it you can find one of the driest and more beautiful deserts in the world. Its central area is the home of several fertile valleys that possess a background made out of the breathtaking high mountains of the Andes. If you head towards the South of our country you will face its ever-present rains and the sublime beauty that comes along with its forests, lakes, and fiords. The transportation system is fast and safe, so you will be able to easily program your trip. It won’t be hard! Santiago is located at the Northern-central part of the country. It has a privileged weather, possessing a long and dry summer. Its maximum temperatures raise up to 30ºC (86ºF ). On the other hand, its winter is short, and it is during this period when it rains the most. However, in Santiago, it rains between 10 to 15 days a year, so it is an ideal weather to plan your outdoor activities, even in winter. The capital is located a little more than an hour from the seaside and the mountains, as well, so it is a strategical place to rest from a long journey, take a Spanish course, and plan some trips to the surrounding areas of the city during weekends. The city is mostly flat, and it has a system of bikeways that has been slowly growing over the past years, making Santiago one of the best cities in which to use such a transportation system. Santiago is a vibrant city with a myriad of cultural, gastronomical and artistic activities throughout the year, as well as an exceptionally live nightlife, which makes it an attractive place for thousands of visitors every year. That is why Santiago is an ideal place for studying Spanish. The word «Newen», in Mapudungu (a native language of our country) means «energy of the universe». We have chosen this name as a way of introducing our foreign visitors to a part of our culture, because we know that learning a language also means learning about the culture to which it belongs. This is one of the reasons that we have founded the Newen Spanish School in Chile. The school is located in front of Parque Forestal, one block away from a metro station and Fine Arts Museum, three blocks away from Santa Lucía Hill and six from San Cristóbal Hill and Metropolitan Park, and surrounded by a lots of coffee shops with an excelent atmosphere. Escuela de español Newen - Santiago, Chile 2007.